It’s my birthday month, lovelies. And you know what that means for me. 31 days of glorious celebrating. Whether it is an extra snooze on the morning alarm, the treat of a massage, a lengthy walk at night with friends, or an extra glass of champagne I like to indulge a little extra every day of the month of August. It’s a happy little way for me to say “Happy Birthday” to myself. This year, especially, though there has been more involvement by champagne, red wine and white wine. It has been so fun, giggling with friends at gorgeous dinners, celebratory cocktails in lounges that overlook the city, a cozy glass of wine at one of my favorite neighborhood restaurants. That being said, there are some mornings where I wake up and just know my body is craving health. My body is craving something clean and fresh with the nutrients to help replenish me. The smoothie below is one of my all time favorites. The base is avocado, it gives you some lovely fats (good for your hair, skin and nails ladies!) which helps keep you full for awhile. To that I add homemade hemp milk or coconut water, juice of 2 lemons and 2 limes (to help alkalize my tummy! ), big handful of spinach, a few sprigs of parsley and a spoonful of local, raw honey. 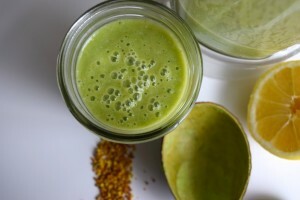 Toss in a little bee pollen for some added nutrients (protein, amino acids, antioxidants). Blend that up and gulp it down, trust me-you will want to. The creaminess from the avocado gives it the feel of a milkshake. 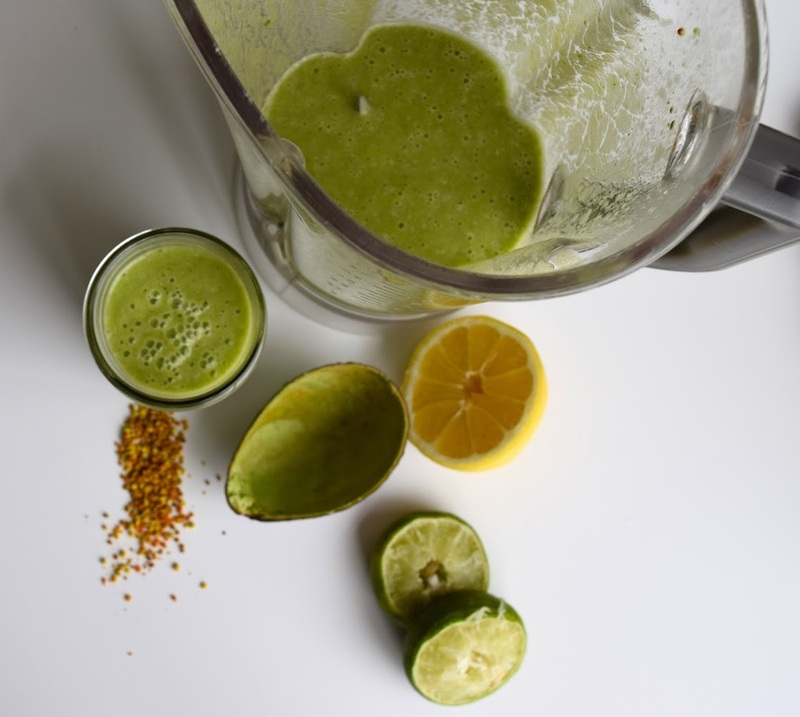 I can’t get enough of this smoothie and I think this month my body can’t either…..
Add everything to a blender and mix until completely smooth. Pour into two glasses and enjoy! You can also make the shake ahead of time, it will last in the refrigerator for up to 3 days.